KAWASAKI - There is a well-worn tradition in the J. League of championship contenders making their title run much more difficult than it needs to be. Kawasaki Frontale seemed content to follow in that tradition on Saturday, falling two goals behind before staging an explosive comeback in a 5-3 home win over Vissel Kobe. The defending champion came into the encounter at Todoroki Stadium knowing that a win would open up a four-point lead on top of the first-division table after second-place Sanfrecce Hiroshima lost 2-0 to Shimizu S-Pulse earlier in the day. 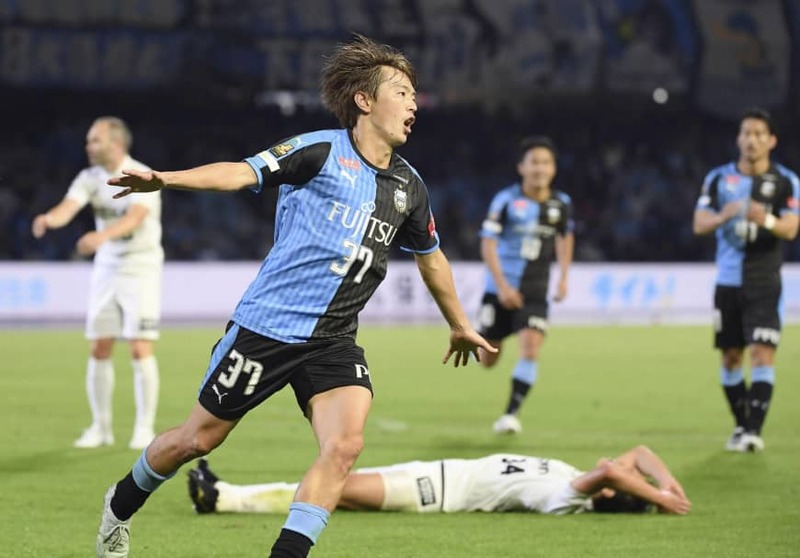 Frontale seemed confident early against their recently winless opponents, jumping to a 1-0 lead in the 13th minute when Yu Kobayashi converted a penalty kick with a straightforward attempt that snuck inside the left post. A torrential downpour that started over 90 minutes before kickoff did not dissuade the sold-out crowd of 24,441, with turquoise ponchos filling large swaths of the back stand. “The atmosphere is a plus for us. We’ve sold out this many games because there are so many fans who have high expectations for our soccer, and we have to play deserving of that,” said Frontale midfielder Kengo Nakamura. Ticket sales had been spurred in part by the anticipated presence of Vissel midfielder Andres Iniesta, who missed sold-out games at FC Tokyo and Urawa Reds in August and September, respectively. Yet the Spaniard’s role was negligible overall in his first start in four matches, and he ended the day without a shot. Instead it was Kobe captain Lukas Podolski who played a major role in the team’s first two goals, the first coming in the 15th minute when the former Germany international shot from the edge of the penalty area. Frontale defender Elsinho attempted to make a clearance, but his effort bounced straight off teammate Tatsuki Nara and into the net for an own goal. In the 28th minute it was Podolski’s cross which found Kyogo Furuhashi, who ripped his third goal of the season from 20 meters out to give Vissel the lead. Just seven minutes later Hirotaka Mita made it 3-1 with a rocket of his own from roughly the same distance. But Frontale was not about to lay down quietly, and Akihiro Ienaga reduced the gap to one goal when he slotted home from in front of the goal just two minutes before halftime. Kawasaki picked up the second half right where it left off, attacking brightly as both Kobayashi and Kengo Nakamura narrowly missed headers. It fell upon attacking midfielder Manabu Saito to tie up the game with a superb grounder in the 65th minute. It was the former Samurai Blue attacker’s first league goal since joining Frontale from Kanagawa rivals Yokohama F. Marinos over the winter. The equalizer appeared to knock the wheels completely off the Kobe bus, and a superb exchange of passes in its penalty area concluded in Ryota Oshima scoring the go-ahead for Frontale just four minutes later. Another seven minutes passed before Elsinho redeemed himself for his earlier blunder with his second goal of the year, making the score 5-3 and all but wrapping up the result for the home side. “Until the 70th minute we controlled the ball and were able to protect our goal,” Vissel manager Juan Manuel Lillo said after the match. ” But when that didn’t result in goals we became frustrated and that affected our play. Elsewhere on Saturday, Sagan Tosu won 3-2 at Vegalta Sendai, with Fernando Torres netting for the visitors and the final five minutes of play delayed for over 40 minutes following a lightning storm. A late Kosuke Onose goal gave Gamba Osaka a 2-1 win over Yokohama F. Marinos, while Yuki Muto scored twice in Urawa Reds’ 3-1 win over the rival Kashima Antlers. Chanathip Songkrasin’s seventh goal of the season salvaged a 2-2 draw for Consadole Sapporo at Shonan Bellmare, while a late Hiroshi Kiyotake goal gave Cerezo Osaka a 1-0 win at FC Tokyo.